BTW- Don't miss out! Shopbop is having a 20% sale that goes until midnight April 18th when you use the code WEAREFAMILY13. On a side note, my thoughts and prayers go out to all those affected by the recent bombings in Boston. It feels a bit wrong speaking about fashion and vacations when such severe tragedies are so close to home and at the forefront of our news in America. I LOVE the blue that is on all of those dresses! Oh this is so good, love them all, and Santorini! 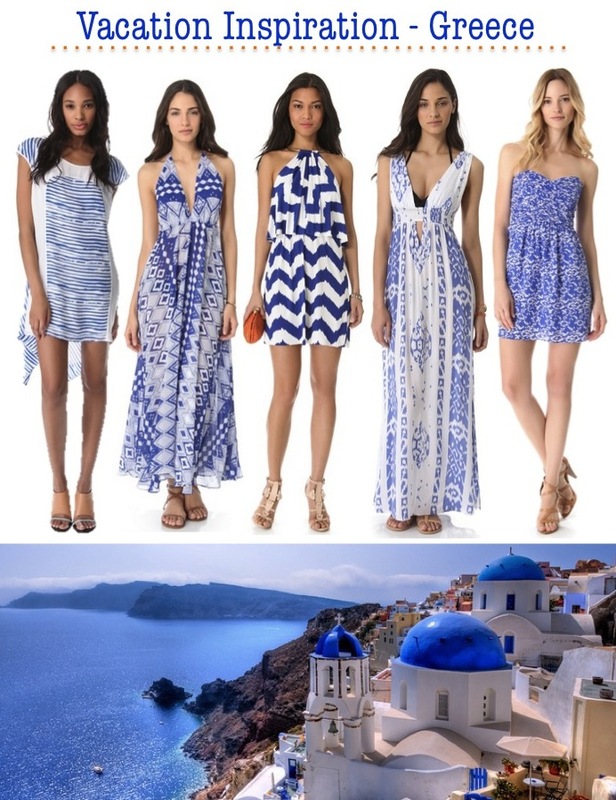 such gorgeous dresses, and all look very suitable for a greek vacation! I love the dress in the middle. Have a good day! Gorgeous picks! I'm also dying to visit the Greek Isles and these images make me crave a beach vacation... badly. I went to Greece on my "spring break" while I was abroad for a semester. The trip itself was kind of a nightmare (we went through one of those sketchy companies! ), but Greece was gorgeous. I'd love to go back for real this time! Maxi dresses are really the best when it comes to vacay fashion.....and I'm sooo inspired by your blue themed choices here Chelsea!!! Yeah I know what you mean hun lol. You've totally nailed the feel of Mykanos. I've never been there before, but I have traveled to other Greek Islands.